After several days of visiting with our children and their families in San Francisco, Susan and I finished our trip on the Coast Starlight to Los Angeles. Our son, Peter, drove us to San Jose through rush hour traffic. (Isn’t every hour rush hour on the 101?) We waited in the restored art deco station until the train pulled in – already about 15 minutes late. For this leg of the trip, we booked a small roomette. We wouldn’t be using the sleeping bunks, but the extra space gave us some leg room, and the fare entitled us to lunch and dinner in the dining car as well as access to the comfortable chairs in the observation area of the parlor car. The camps disappeared once we got out of the city, but it was then that I made my second observation: We think of California’s Central Valley as the garden of America. If you have travelled on Interstate Highway 5, you know that the Valley is rich with agriculture. But it is mostly fields of fruit and nut trees, dairies, and alfalfa fields. The real gardens line the 101 in the Santa Clara and Salinas Valleys between San Jose and Paso Robles. There are huge fields of strawberries with workers in long rows, bent over to harvest the fruits. There are artichokes, lettuce, onions, cabbages, broccoli, garlic, and many plants that cannot be identified from a moving train. Gilroy has been called “Garlic Capital of the World” (although that title probably now belongs to some place in China) and you can smell the garlic when you go through town. Of course, there are grapes – in recent years all of California seems to have become one big vineyard – but there are also huge fields of ornamental houseplants. And most of the farms are filled with armies of harvesters with their beat-up old cars parked along the edge of the fields next to portable toilets mounted on little trailers. We went to the dining car for lunch as the train headed into the mountains. W enjoyed the views, but the lunch choices were the same as they had been for our first day on the train. 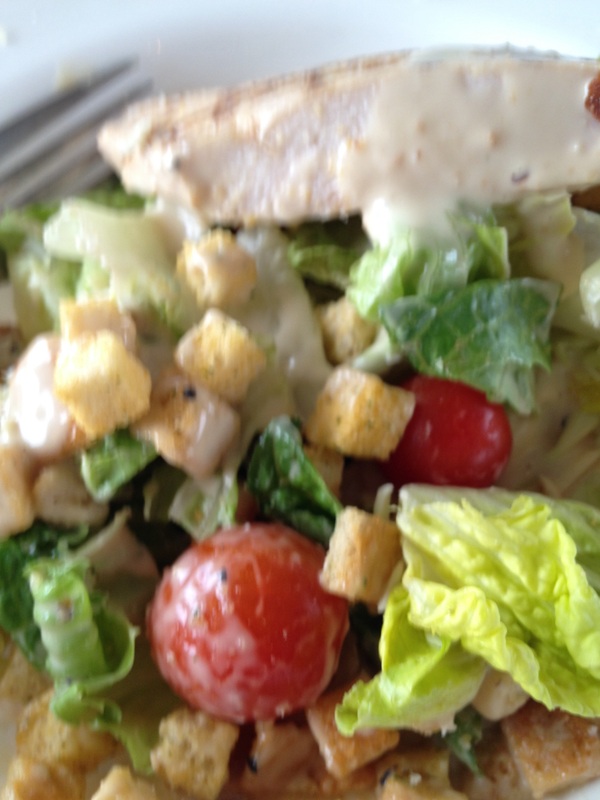 We passed on the sautéed panko-crusted chicken with mashed potatoes and instead opted for the “Chicken Caesar Salad” which was actually the regular salad mix with chicken, the same little hard croutons, and Newman’s Own salad dressing. I didn’t see any Parmesan. And there were certainly no anchovies. All told, though, it was pretty good and better than the panko chicken. The highlight of the trip was just ahead. Shortly after a stop in San Luis Obispo (“SLO Town” to Californians) we headed onto the coast. The train hugged the cliffs as it made its way around Vandenberg Air Force Base where we could see several towers that are used to launch the military’s experimental rockets. Then it was beautiful beaches, surf, rocks, lighthouses, and steep cliffs. We enjoyed the wine tasting again, and then it was time for dinner. We ate in the parlor car, and even though they were running out of things, we enjoyed the vegetarian lasagna rolls for Susan and the three-pepper braised short ribs for me. The sun playing on the waves turned out to be a magical background for a very nice meal. Soon enough we got to Santa Barbara and then it became continuous freeways and people until we pulled in to the Los Angeles Union Station right on time. There was one last treat for a memorable trip, it was raining while we waited for our daughter, not enough to break the terrible West Coast drought, but enough to give some hope. 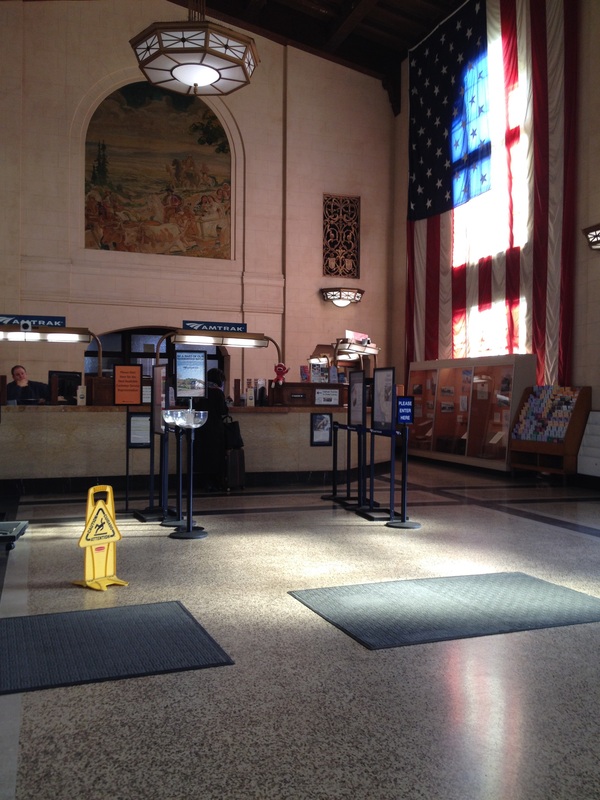 We left our hotel before rush hour for a short taxi ride to the carefully restored Amtrak station. Our train from Vancouver, BC, pulled up to the gates, a good-sized crowd loaded up, and at exactly the designated hour we departed downtown Seattle. There is always the mystique that trains take you to scenic places – and often that is true – but in big cities, you frequently see things that have been carefully hidden: truck terminals, rows of box cars and tank cars, and hobo camps filled with crumpled sleeping bags, cardboard boxes, and plastic crates. At the same time, it is interesting to look out at the panoramas of the city and scenes that you would miss from the freeway. Soon enough, the messiness of the city gives way to the countryside, with lush trees, hillsides of yellow-flowered shrubs, and fields in every imaginable shade of green. 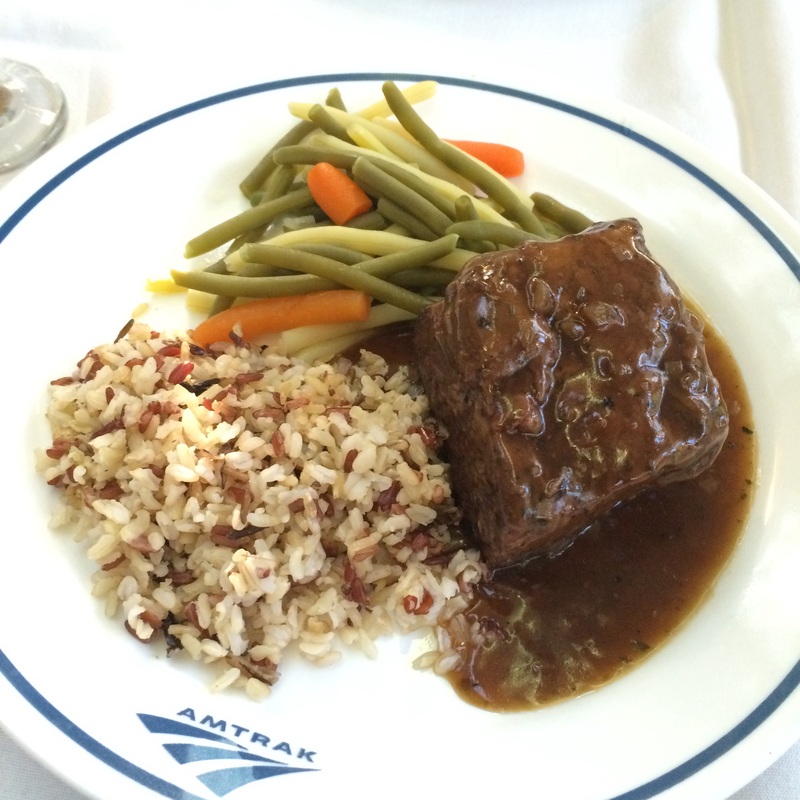 We missed breakfast at the hotel, so we were looking forward to lunch in the dining car. The steward came by and gave us a slip of paper with our time to show up in the dining car. 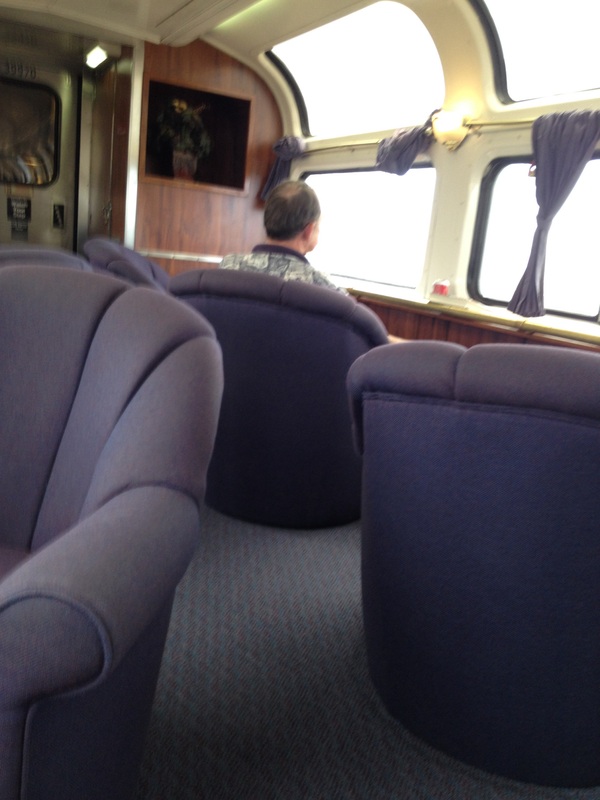 Then, at the appointed time, we heard an announcement that we should make our way to the dining car. If you have never eaten in a dining car, there is a very fixed ritual, which the server will describe with a certain fatigue and indignation that must come from having done the same thing with thousands of past passengers. You sign your name and fill in the blanks for your car number and room. The server fills in everything else after you have chosen your meal. As is customary, we were seated with two strangers: one was a very pleasant middle-aged man who was on his way to help his niece celebrate her college graduation; the other was a college-aged young man who had absolutely no interest in engaging in conversation with old galoots. He wolfed down his sandwich as soon as it was delivered, mumbled something about how nice it was to meet us, and hastily beat an exit out the door. We selected the sautéed chicken special. It came with a salad composed of the white ends of iceberg lettuce leaves (How did they manage to buy nothing but white ends?) and two cherry tomatoes that rolled around on the thin plastic plate with every lurch of the car, defying my best efforts to spear them with the little salad fork. The main dish was a breaded chicken breast that looked suspiciously like a chicken tender and had a similar taste. It was accompanied by a mound of mashed potatoes decorated with yet another cherry tomato. Dessert was a choice of cheesecake, cheesecake with strawberries, chocolate mousse, or ice cream. They all came in little plastic cups. The food highlight of the day was a wine tasting in the parlour car mid-afternoon. It was very pleasant and cost only $7.50 per person. The steward gave everyone good pours of actually not-too-bad wine. Our experience was so good that we decided to change our dinner reservations from the dining car to the parlour car. That was a good choice because we got a table by ourselves, and the pepper steak was not too bad. Dessert choices were the same, but this time they were removed from the plastic cups and served on little plastic plates with the Amtrak logo. Never mind. The scenery, especially in the Cascade Mountains was spectacular, and we stayed up, looking out the window until dark. Then the car attendant made up our beds, and we settled in for the night. Sleeping was not too bad. We woke up with the train in the station at Sacramento. We dressed, went to breakfast in the parlour car, and sat in the comfortable chairs next to the tables, watching the scenery until it was time to get off th train in Emeryville. 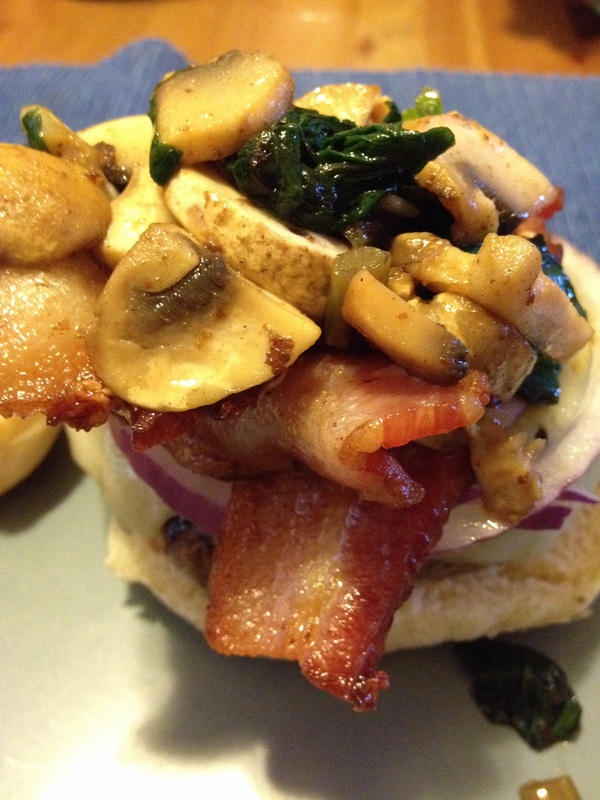 The best food of the trip was a hamburger that our daughter prepared for lunch when we got to her apartment – mushrooms, Swiss cheese, bacon, arugula, shallots, and dill pickles. Good food at the end of an interesting trip.